Just as we expected, Eurodollar started new ascending movement. Right now, market is being corrected, but may start moving upwards again quite soon. Target is near 78.6%, where there are several fibo-levels. As we can see at H1 chart, price is already moving above 61.8%, which means that it may continue growing up. According to analysis of temporary fibo-zones, predicted targets may be reached until the end of this week. Franc reached new minimum and is not going to reverse upwards yet. Most likely, price will reach several new minimums. 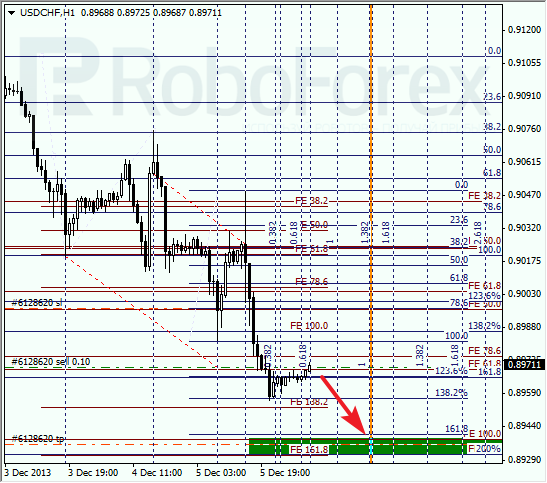 Closest target is at 0.8935, where there are three fibo-levels. At H1 chart, market is being corrected. According to analysis of temporary fibo-zones, lower levels may be reached during the day.